Reptile care guidelines, breeding articles and herping articles. 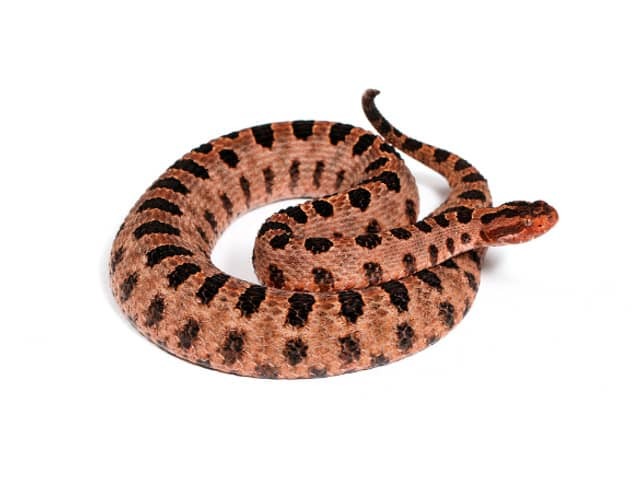 Sistrurus miliarius is a small sized venomous pit viper species. Three subspecies are currently recognized S.m.barbouri, S.m.miliarius and S.m.streckeri. The dorsal pattern of consists of a series of oval or subcircular spots with reasonably regular edges. The spots on the flanks are mostly round and not much higher than they are wide. Belly pigmentation towards the rear is more limited to indistinct blotches found on pairs of adjacent scales. Juveniles have a color pattern that is similar to the adults, although it may be paler or more vividly marked, and the tip of the tail is yellow. 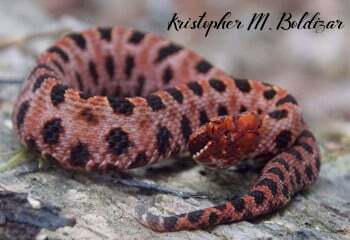 Sistrurus miliarius were meant for natural vivariums. Their small size means that plants and decorations will most likely stay put, and their habit of sitting in an ambush position for long periods of time makes them great display animals. A 20 gallon long aquarium or equivalent will suffice for a single pygmy, pairs and trios can be housed in something a bit larger, approximately 0.9 x 0.45 meters (3 X 1.5 feet) base area. When selecting an enclosure, bear in mind that screen tops can be difficult to lock, and the possibility of you, other people, or pets being bitten through the screen exists. Commercially produced caging with lockable sliding glass doors is the best choice. Whatever the enclosure, it should be escape-proof, lockable and well-ventilated. The decision to decorate your pygmy’s home or not is entirely up to you. Adding a few plants, real or fake, and some bark or sticks will not only enhance the appearance of your enclosure, they will make your snake feel more secure. This will keep your pygmy happier, healthier and allow it the confidence to explore areas other than the inside of its hide. Various substrates are acceptable including newspaper, shredded aspen, bark style bedding, and cypress mulch. As with any reptile, avoid cedar shavings because the oils contained in it are harmful. Sistrurus miliarius are pros at basking, and they are often spotted in grassy field-edges, coiled up in the sun. To replicate this, a basking area should be provided at one end of the enclosure, with the temperature right about 32 °C (90 °F). Be sure that there is a proper thermal gradient available, however with daytime temps away from the basking spot around 27-28 °C (81-83 °F). At night, the ambient temperature should drop about 6 °C (10 °F) degrees or so, somewhere around 21-23 °C (71-73 °F) is ideal. If you are planning to breed your pygmies, it is important that they are correctly cycled. This means providing a 3-4 month period of cool temperatures, low light and minimal interaction, usually timed to coincide with winter. Cycling your pygmies also helps to promote healthy weights and maintain biological processes. To achieve this successfully, you’ll need an area that can be kept dark and cool, with temperatures around 11-14 °C (52-57 °F). Slowly reduce temperatures and light over a 2-3 week period, after the snake has fully digested and passed its last meal. Maintain the temps as constant as possible and allow as little light as you can. I often use a red LED light to check on my animals due to low visibility and low heat, so as to make checkups almost stress free. If you brumate your pygmy After about 8-10 weeks, slowly increase temperature and light, again over a 2-3 week period. I typically wait until the 4th week to offer food, and I always offer prey that is smaller than what they’re capable of consuming. The enclosure must contain a source of fresh, clean water. This is essential for properly maintaining any healthy reptile. Since pygmies I are never usually found far from water and live in the southeastern United States, they don’t like it dry. They won’t tolerate being wet constantly but it is a more important to never let them be completely dry for any extended amount of time. Young snakes are prone to dehydration rather quickly given their small size. As long as there is a constant supply of fresh water, there is no specific humidity requirement but misting once or twice a week, especially during a shed cycle, is a good idea. Maintaining a correct temperature range is essential to the overall health of your pygmy, especially ensuring proper food digestion. Since live prey has the potential to injure your snake, frozen/thawed or fresh-killed mice in various stages of development are the best food to offer your pygmy rattler. Once per week is the average feeding schedule for pygmies from babies to adults, but older adults may require even less frequency. Although most snakes are known for the ability to eat quite large meals, food items for pygmies should not be much bigger in diameter than the snake’s head. These increased interactions acclimate the snake to your presence and help it learn that you are not a threat comma which I believe is very important for safe interactions with any venomous snake. Pygmies are very defensive little rattlesnakes and often do not sit on a hook well. It takes quite a bit of practice to be able to shift one around comfortably on a hook. They are capable of amazing bursts of speed and can change direction in an instant, so use caution when you do have to handle them. I personally keep my pygmies on Cypress mulch which absorbs well and is easy to spot clean. I recommend that all reptile enclosures be spot cleaned as soon as you notice the mess. This not only ensures very clean conditions but also increases the frequency with which you interact with your snake. Misting the enclosure once or twice a week during a shed cycle is a good idea to help your snakes through the process. Choosing prey that is too large can result in regurgitation, and it will adversely affect your pygmy’s health. Even the best enclosures are much smaller than the natural home range a pygmy would utilize in the wild, leading to a reduced level of physical activity in captives. It is also quite easy for a well-intentioned, eager keeper to accidentally overfeed their snakes. The combination of these can lead to obesity, a leading cause of premature death in captive pit vipers. Observing your pygmy regularly and making necessary adjustments to the care you are providing is extremely important to its longevity and well-being. It’s highly recommended for every venomous species that you keep or interested to keep to have the bite protocol. Each species has a dedicated bite protocol that includes general information regarding the species, information about their venom and signs and symptoms of envenomation if bitten. It also includes a detailed information about first aid (what to do and what not to do), specific treatment recommendations for medical personnel to provide appropriate care including information about the antivenom or antivenoms required for treatment. Finally it includes a list of people who specialize in snakebites and their contact information so they can be consulted to assist with the care if needed and a list of all the references used for the create the protocol. The information contained in this care sheet reflect the opinions and methods of the mentioned breeder, based on their expertise and long-established experience. © ReptileTalk NET 2019 - All Rights Reserved.